The principal aim of the course is to prepare students for the understanding of Biochemistry and Molecular Biology. This requires a firm knowledge of the basics of general, organic and inorganic chemistry. Relation of atomic radius, ionization energy, electron affinity and electronegativity to the periodic table. Ionic bond, ion radius, ions. Covalent bonding, s and p bonds, hybrid orbitals, hybridization of carbon. Electron pair repulsion, geometry of molecules, bond angle. Molecular orbital theory. Polar covalent bonds. Molecules composed of more than two atoms. Coordinative bond. Structure and geometry of ions. Metallic bonding. Interactions between molecules: electrostatic interactions, van der Waals and hydrogen bonds. Structure of water, its properties. Physical states. Types of crystals, characteristic crystal lattices. Solute, solvent, solution. The solution process. Solubility of ions in water, dissociation. Enthalpy of hydration. Concentration, % and molar concentration, normality, molality, molar fraction. Saturated solutions. Solubility, partition, solubility product. Demonstration on calculation problems. Laws of dilute solutions. Vapor pressure, freezing point, boiling point of pure solvents. Vapor pressure of solutions, Raoult's law. Freezing point depression and boiling point elevation of aqueous solutions. Osmotic pressure, dependence on temperature, solute concentration and ionic dissociation. Biological and medical importance of osmosis. Electrolytes, degree of dissociation and the ionization constant, their correlation. Conductance of electrolytes, specific and equivalent conductance of strong and weak electrolytes. Acid-base theories. The Arrhenius theory. Classification of acids and bases, their anhydrides. The Bronsted-Lowry concept. The Lewis concept (e.g. coordination compounds). Acidic strenght and the molecular structure. The ionization of water. Water product, definition of pH and pOH. The pH scale. Calculation of pH for strong electrolytes. The effect of strong acids and bases on the ionization of weak acids and bases, respectively. The effect of strong acids and bases on the salts of weak acids and bases. Buffers, calculation of pH of buffers. Buffers of polyprotic acids. Buffers of physiological importance. The carbonic acid/hydrogencarbonate buffer. Buffer capacity. Acid-base indicators. Titration curves of strong and weak electrolytes. The selection of indicator for titrations. The amphoteric character. Basic and acidic salts. Double salts, complexes. Geometry of complexes, chelates. Reaction of salts with water (hydrolysis). Redox processes. Oxidation number, its definition. redox equations. The electrode potential, its explanation. Normal and standard potentials. Galvanic cells, Nernst equation. Concentration cells, the principle of electrometric pH measurement. Non-polarizable electrodes, their utilization in practice. Biological redox potential, redox electrodes. The application of redoxi potential for biological processes, the principle of mitochondrial energy production. Electrolysis. Chemical thermodynamics. Internal energy and enthalpy, reaction heat, standard enthalpy. Hess' law. Combustion heat, atomic and molecular enthalpy of formation. Bonding energy. The I. and II. laws of thermodynamics, entropy, free energy and free enthalpy. Relation between electromotive force and free enthalpy change. Exergonic and endergonic processes. The equilibrium constant. The direction of the processes and its relation to free energy change. Reaction kinetics, rate of reaction, order and molecularity. Half-time of reactions. The van't Hoff rule. Activated complex, transition state, activation energy. The Arrhenius equation. Catalysis, catalysts. Reversible processes, the law of mass action, equilibrium constant and its relation to free energy change. Consecutive reactions, the importance of rate-limiting steps in metabolic processes. Introduction, definition of organic compounds, their composition. Homologous series, constitution, constitution isomerism. Classification according to carbon skeletons and functional groups. Characterization of bondings in organic compounds, bonding energy, distance of atoms, dipole moment. Apolar and polar character, inductive and inductomeric, mezomeric and electromeric effects. The vectorial character of dipole moment. Optical isomerism: structural principles of rotation. Chirality, chiral carbon atoms, configuration, enantiomers. Principle of relative and absolute configuration. Projected formulas. Compounds with more than one chiral center: diastereomerism, mezo-forms. Separation of optical isomers. Alkanes, cycloalkanes, their homologous series. Steric forms, conformations, conformational isomerism. Physicochemical properties of paraffines. Steric structure of cycloalkanes. Alkenes, their homologous series. Constitutional and configurational isomerism. Chemical properties of alkenes, possible mechanisms of addition reactions. Hydrocarbones containing more double bonds, delocalization of p-electrons in compounds containing conjugated double bonds. Acetylene: physicochemical properties. Aromatic hydrocarbons: homologous series, isomerism. The explanation of the aromatic character by the electronic structure. Chemical behavior of benzene and its homologues. Substitution, oxidation, reduction, direction rules in repeated substitutions. General characterization of heteroaromatic compounds, important heteroaromatic compounds. Classification of organic compounds according to their functional groups. I. Halogenated hydrocarbons, their physicochemical properties. II. Organic compounds containing hydroxyl groups. Classification. Alcohols, physical properties, chemical reactions. Enols and phenols, their chemical reactions. Synthesis of ethers, their reactions. III. Oxo compounds: classification, nomenclature, physical properties. Chemical reactions of aldehydes and ketones, nucleophilic addition reactions. Condensation reactions of oxo-compounds, oxidation reduction, substitution on the carbon chain. IV. Carboxylic acids and their derivatives. Classification, nomenclature, their synthesis, physical properties. The explanation of the acidic character of carboxylic group, the effects of substituents on the acidic character. Chemical reactions of monoprotic carboxylic acids, formation of esters, haloids, amides and anhydrides. Substitution of the carbon chain: synthesis of halogenated, hydroxy-, keto- and amino acids. Acidic character of dicarboxylix acids, important reactions. Chemical reactions of hydroxy- and ketoacids. Important representatives of dicarboxylic, hydroxy- and ketoacids. V. Organic compounds containing sulfur: thiols, thiophenols and thioethers, their synthesis and physicochemical properties. VI. Organic compounds containing nitrogen: classification, physicochemical properties of nitro compounds. Amines, classification, synthesis, basicity. Important chemical reactions of amines (e.g. Schiff base formations). Amides of carbonic acids. Group of halogens, their biological significance. Oxygen group, oxygen, free radicals containing oxygen, air, air pollution, ozone. Sulfur, its compounds. The nitrogen group. Nitrogen, its important inorganic compounds. Nitrogen cycle. Phosphorus and its compounds. Carbon group, carbon and its important inorganic compounds. The air polluting effect of carbon dioxide. Hydrogen and noble gases. Alkali metals and their compounds. Alkali earth metals and their compounds, the biological significance of calcium and magnesium. Earth metals. Heavy metals and their biological importance. Precious metals. Participation in the laboratory practicals is obligatory; students should sign the attendance sheets at the end of the practicals. In case of more than three absences from the practicals for any reason, the semester will not be acknowledged and the student is not allowed to sit for the semifinal exam. Missed practicals can be completed only in the same week at another group; certificate from the host teacher should be presented by the student to the assigned teacher. Only students who successfully completed the semester, thus obtained an official electronic Neptun signature, are entitled to sit for the semifinal exam. The semifinal is a written exam that consists of two theoretical parts and a practical exam. First theoretical part (50 min): drawing 10 structures (both inorganic and organic, 1 point each) and solving five chemical calculations (2 points each). The list of structures to be memorized can be found on the last page of this document. Please note that any inorganic base or salt might be asked that can be formed by combining any cations and anions provided there. Moreover, any normal or branched-chain alkane, alkene or alkyne (up to eight carbon atoms) can be asked such as 2,3-dimethyl-pentane, 3-methyl-2-hexene etc. Second theoretical part (80 min): 40 multiple choice questions (1 point each). Practical exam (15 min): an essay question on a laboratory experiment performed during the semester (evaluation: 0, unacceptable; 1 point, minor mistakes; 2 points, clear, detailed and correct). Exact quantities (mass, volume of reagents, incubation times etc.) are not expected here. The total score is 20 + 40 + 2 = 62. - 0 point from the practical exam. Students who pass both part 1 AND part 2 but fail the practical essay have to retake only the practical essay when they repeat the semifinal exam. Those who want a better grade are entitled to rewrite also the first 2 parts, however, with the risk of performing worse. Students who pass the practical exam but fail either part 1 or part 2 (or both parts) have to retake both theoretical parts but not the practical exam. 60-72 points = grade 5 (excellent). It is possible to write the practical essay in week 14, in the first 15 minutes of the last laboratory practical of the semester. Students successfully completing this test (getting 1 or 2 points) are exempted from writing the practical exam at the semifinal exam. It is to note that this is an extra opportunity for passing the practical exam prior to the beginning of the exam period and in case of failure the semifinal exam should proceed as outlined above. Those students who have passed BOTH midterm examinations with a grade of 3 or better are entitled to participate in the competition. Students intending to participate should register in advance by sending an e-mail to the tutor (keszler.gergely@med.semmelweis-univ.hu). The competition is organized in week 14 (the exact date and venue will be announced later). It is based on the whole material of the semester and has the same structure as the written exam. The winners will be exempted from the semifinal. Students who learned general, inorganic and organic chemistry at an academic institution prior to the commencement of their studies at Semmelweis University might sit for an exemption exam that takes place at the beginning of October. Students are kindly asked to present their official documents (transcripts with exam results and a detailed description of the curriculum they completed) to the tutor (Gergely Keszler, EOK building, room 2.132; deadline: 27th September, 2013). The exemption exam will correspond to parts 1 and 2 of the semifinal (structures, multiple choice tests and calculations). electronically, via the Semmelweis University Neptun System. Retakes are not possible within 3 days following the exam. Only unsuccessful exams can be repeated in the last exam week („extension period”). All our examination rules comply with the official examination regulations of the Semmelweis University. 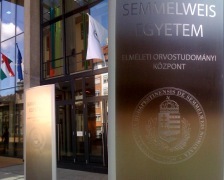 Manuscripts can be purchased in the bookshops of Semmelweis Publisher (on the ground floor of the NET and EOK buildings). 5. Solutions. Solute, solvent. Solubility. The solution process. Solubility of iodine in organic solvents and in water. Lugol solution. Solution of ionic crystals (NaCl) and crystals of polar substances (glucose) in water. Hydrated ions. (Ebbing pp. 481-497). 11. Exergonic and endergonic reactions. Definition of the equilibrium constant (Keq). The low of mass action. The range of Keq and pKeq for spontaneous and non-spontaneous reactions. Predicting the direction of a reaction. Le Chatelier principle. Effects of changes in concentration, pressure and temperature for the equilibrium (examples). (Ebbing pp. 621-649). 12. The ionization of water. Water product, definition of pH and pOH. The pH scale. Calculation of pH for strong electrolytes. Examples of strong acids and bases. 13. Acid-base theories. The Arrhenius concept. The Bronsted-Lowry concept (examples). The Lewis concept (examples). Acidic strength and the molecular structure. Hydrides, oxiacids (examples). 14. pH of weak acids and bases. Degree of dissociation and the ionization constant. Definition of pKa and pKb. Conjugated acids and bases. Examples. 15. Common ion effect: pH dependence of acid/base equilibriums. Effect of strong acid on the ionization of a weak acid. Acid-base indicators used for titration of strong and weak acids. The Henderson-Hasselbalch equation. Effect of pH on the ionization of weak electrolytes (examples: acetic acid, ammonia, amino acids). 16. Polyprotic acids. pH dependence of their ionization. Examples: carbonic acid and phosphoric acid. 17. pH of salts. Anion-hydrolysis and cation-hydrolysis (examples). pH of acidic salts (examples: NaHSO4, NaHCO3, NaH2PO4 and NaHPO4). 18. Buffers. Principle of maintaining a constant pH (examples). Buffer capacity. Comparison of acid and base capacity. The phosphate buffers. 19. Titration curves. Comparison of strong and weak electrolytes. Titration curves of polyprotic acids. pH of the equivalence points. Buffer ranges. 20. Buffers of physiological importance. Buffer effect of the phosphate group. The carbonic acid / hydrogen carbonate buffer. The pH-bicarbonate diagram. Effect of stabilization of carbon dioxide and bicarbonate concentration on the buffer capacity. Total acidity of the urine. Respiratory acidosis. 21. Solubility of salts. The solubility product. Saturated solutions, solubility. Conditions for precipitation. Examples of well soluble and mainly water insoluble compounds. 36. Effect of the concentration on the electrode potential. Concentration cells made from cation- and anion electrodes. The hydrogen electrode. Measurement of pH, the glass electrode. 1. Alkali metals and their compounds. 2. The alkaline earth metals and their compounds. 3. Boron and aluminium family metals. 4. Allotropes of carbon. CO.
5. Carbon dioxide. Carbonic acid and its salts. Cyanides. 6. Silicon and derivatives. Tin and lead and their compounds. 7. Properties of nitrogen. The nitrogen cycle. Ammonia, hydrazine and hydroxylamine. 8. Oxides of nitrogen. Oxiacids containing nitrogen. Nitrites and nitrates. 9. Phosphorus and its compounds: allotropes, oxides, oxiacids, phosphates. 10. Arsenic, antimony, bismuth and their compounds. 11. Oxygen and its compounds: allotropes, oxides, peroxides, superoxides. 13. Sulfur and its compounds: allotropes, oxides, oxiacids, sulfides, sulfites, sulfates, thiosulfates. 14. Characteristics of halogens. Fluorine and its compounds. 15. Chlorine and its compounds. 16. Bromine, iodine, their compounds. 18. Transition elements. Manganese, iron, cobalt and their compounds. 19. Copper, zinc, mercury and their compounds. Precious metals. 1. The concept of constitution, configuration and conformation in organic chemistry. Constitutional isomerism and stereoisomerism. Chain and position isomerism. 2. The principal bond types in organic compounds: their characteristic properties and features. Electron polarisation. The tetrahedrical and planar structure of organic compounds: sp3, sp2 hybrid orbitals in carbon containing compounds. 3. Conformational conditions in open chain (aliphatic) and non aromatic (alicyclic) organic compounds: eclipsed and open forms, periplanar and clinal forms, syn and anti forms. 4. Cis-trans isomerism in aliphatic and alicyclic compounds. 5. Optical isomerism. The concept, cause and measurement of optical activity: chiral and achiral compounds. Enantiomers and diastereomers. 6. Representation of chiral compounds: projective formula. Relative and absolute configuration: the D-L and R-S system. 7. Delocalisation of bonds (resonance) in organic compounds: structural isomerism and tautomerism. 8. The principal reaction types (substitution, addition and elimination). Reaction mechanisms (radical, electrophilic and nucleophilic) in organic chemistry. 9. The structure, properties and reactions of alkenes and cyclic alkenes. 10. The structure, properties, reactions and several representatives of alkenes and cyclis alkenes. 11. The aromatic character. The oxidation and reduction of aromatic compounds. 12. The principal representatives of homo- and heteroaromatic monocyclic and polycyclic compounds. 13. Substitution type reactions of aromatic compounds. Direction rules in the case of repeated substitution. 14. The halogen derivatives of hydrocarbons: alkyl- and aryl-halogenides: their synthesis, their role in the preparation of O-, S-, and N-containing organic compounds, some important representatives. 15. Organic compounds containing -OH groups: alcohols, enols, phenols: their synthesis, grouping principles. 16. The principal characteristics and reactions of alcohols. The most important representatives of alcohols. Ethers as alcohol derivatives. 17. The principal characteristics and reactions of phenols: their most important representatives. The -OH derivatives of purine and pyrimidine. 18. The synthesis and principal characteristics of oxo-compounds (aldehydes, ketones, quinones). The oxidation and reduction of oxo-compounds. 19. Addition and condensation type reactions of aldehydes and ketones (addition of simple inorganic molecules; dimerisation, polymerisation, aldole formation, acetal formation, formation of ketimines, oximes, hydrazones, Schiff's bases). 20. The electronic structure of the carboxylate anion, the most important mono-, di- and tricarboxylic acids. 21. Condensation type reactions of organic acids: ester- and anhydrid-formation, lactones. 22. Halogen-, hydroxy--, oxo- and amino derivatives of carboxylic acids. 23. Decarboxylation. The decarboxylated products of amino-, hydroxy- and keto acids. 24. Organic thio-compounds. Thioalcohols, thioethers, sulfonic acids. 25. Amino- and imino-derivatives of hydrocarbons: their formation, classification and base character. 26. The principal reactions of organic amines: acylation, reaction with HNO2, deamination, transamination. 27. The most important representatives of organic amines in living organisms. The amine derivatives of carbonic acid: carbamoyl-P, urea, guanidine, creatine, barbiturate. Types of bondings and derivatives: ether, phenolether, thioether, ester, lactone, thioester, anhydride (including mixed and phosphoric acid anhydrides), hemiacetale, hemiketale (cyclic forms included), Schiff-base, oxime, hydrazone, hydroxamic acid, amide, thiol, sulfinic acid, sulfonic acid, sulfoxide, acyl chloride.